Introducing new Americans to New Hampshire’s technology career opportunities is a beneficial approach to workforce training. The Code Exploration course ran from mid-May through June. It connected participants with possible career paths while teaching technical, analytical and logical thinking skills directly from representatives from New Hampshire’s technology community. The course was designed and led by Tiffany Brand, the Center’s Computer Literacy Instructor and boasted an impressive lineup of co-teachers including Dave Lemaire, Senior Director of Technology at Oracle + Dyn, Jim Wilcox, Architect at BlueMetal and Justin Herrin, Front End Developer at Altos. The Code Exploration course ran from mid-May through June. 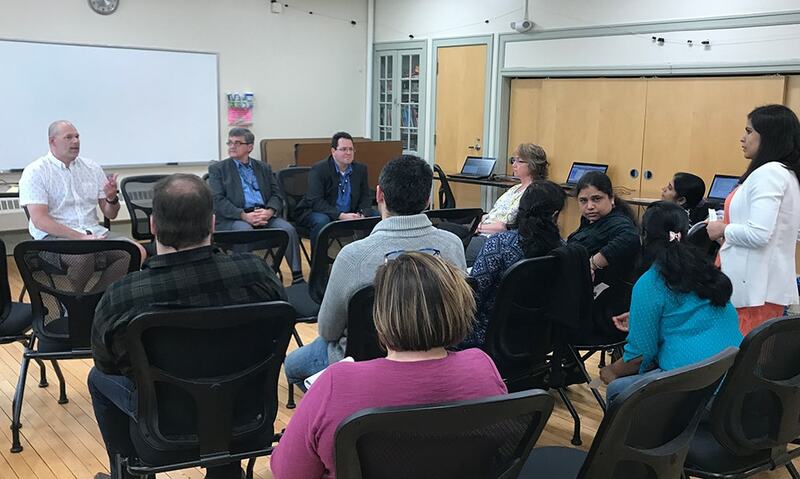 It connected participants with possible career paths while teaching technical, analytical and logical thinking skills directly from representatives from New Hampshire’s technology community. The course boasted an impressive lineup of co-teachers including Dave Lemaire, Senior Director of Technology at Oracle + Dyn, Jim Wilcox, Architect at BlueMetal and Justin Herrin, Front End Developer at Altos. The program culminated in a Career Exploration Day where students presented their coursework to industry professionals and educators. Careers in IT offer competitive salaries for those with the right training, and the state’s current shortage of technology workers provides ample opportunities for DALC students. Many possess technical skills, but lack familiarity with the language and culture of the technology field in the U.S., making professional development and career exploration a challenge. Workforce training like the Dover Adult Learning Center’s Code Exploration Program creates a pipeline of smart, motivated people with an interest in continuing education towards a more formal IT certificate or degree. A recent survey conducted by the Dover Adult Learning Center concluded that nearly 20 percent of its current English as a Second Language (ESL) population holds a Master’s Degree, and 45 percent hold a bachelor’s degree. Nearly 90 percent of the students that participated in the program indicated that they are likely to continue their education or pursue a career in Computer Science. More than half of the survey respondents indicated that they plan to reside in the US for an extended period of time, and center’s current population represents more than 15 countries from around the world. While most of the workforce development initiatives in New Hampshire are focusing on retaining college graduates, the state’s adult learning and ESL populations shouldn’t be ignored. Resources like the Dover Adult Learning Center are often associated with high school completion programs however, many of DALC’s students hold bachelor and even doctoral degrees from their native countries. Talk about a technical talent pipeline! Dover Adult Learning Center of Strafford County helps adults in the Strafford County area enhance their life-coping skills and improve their lives through basic education, job training, high school completion, and enrichment classes. It empowers students to become more effective lifelong learners, family members, workers, and citizens. The Adult Learning Center has been recognized as an Outstanding Adult Education Program by the US Secretary of Education several times in its 40 plus year history. It is one of the three largest Adult Education Programs in New Hampshire. For more information about the Dover Adult Learning Center and its workforce training, computer, and career classes visit doveradultlearning.org.